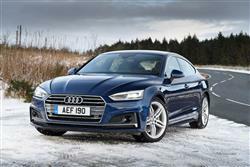 Find out everything you need to know on the new Audi A5 from independent vehicle review website Car And Driving. You can watch the video review to the left to see more of the car or read their written review below to get a true insight from an expert in the automotive industry. When it comes to prestigiously-badged compact executive German cars, traditional thinking suggests that estates are fine but five-door hatchbacks aren't. Audi however, hasn't made it to the top of the pile by traditional thinking and their second generation A5 Sportback continues to turn such thinking on its head, with coupe styling married to a couple of rear passenger doors and hatchback practicality. Back in 2010, the original version of Audi's A5 Sportback was the first hatchback in the compact executive segment, the area of the market dominated by models like Audi's A4, BMW's 3 Series and the Mercedes C-Class. Previously, we'd seen estates in this sector, but never a hatch. The A5 Sportback changed that - and was so successful that BMW was forced to copy its concept with subsequent 3 Series Gran Turismo and 4 Series Gran Coupe models. Audi though, reckons that the original is still the best and aims to underline that perspective with the second generation version we look at here. Like the MK2 model A5 Coupe which shares this car's underpinnings and engineware, this Sportback is sharper-looking, more efficient and lighter than its predecessor. It's also much better equipped and more technologically advanced. Time to check it out in a little more detail. This second generation A5 Sportback sits on an all-new platform with a wide track and a comparatively long wheelbase, all ingredients that should provide for composed, agile handling. There's a more sophisticated suspension set-up too, with a more sophisticated five-link system replacing the trapezoidal link rear suspension used previously. As you'd expect, there's an adaptive damping option you can control through the standard 'Audi drive select' vehicle dynamics system that all A5 Sportback models get. At its simplest, this set-up allows you to control all the usual things - throttle response, steering feel and, on S tronic auto models, gearshift timings too. You'll want to know about engines. Petrols first - there are a couple of 2.0 TFSI petrol options, with a choice of either 190 or 252PS, the latter variant able to reach 62mph in just 6s. Most will want a diesel though. There's a 190PS 2.0 TDI option that's also available in frugal 'ultra' form. And a six cylinder 3.0 TDI variant offering 286PS and a mighty 620Nm of torque, so it should feel genuinely quick. As should the range flagship, the 354PS V6 petrol turbo S5 sports model. This develops 500Nm of torque and sprints to 62mph in just 4.7s on the way to an artificially governed top speed of 155mph. As usual, quattro 4WD is either optional or standard-fit on more powerful models. Audi designers have brought together dramatic shapes and taut surfaces to update this A5 Sportback, creating a familiar yet very contemporary silhouette for the five-door coupe design that retains the original's handsome good looks. The stretched wheelbase, short overhangs and long, wraparound bonnet featuring a power dome emphasise the sporty silhouette. And the three-dimensional Singleframe grille is significantly flatter and wider than on the previous model. In profile, the wave-pattern shoulder line is a key contributor to the A5 Sportback's elegant stance. And inside? Well it's significantly more spacious. The interior length has gained 17mm, the shoulder room for driver and front passenger is up 11mm and the rear knee room is up by 24mm. The horizontal architecture of the instrument panel creates a sense of spaciousness too and the optional ambient lighting system with 30 colours to choose from should evoke a fitting interior mood. There's 480-litres of luggage capacity, which is close to the best in this class. Plus Audi also offers the option of sensor control for opening and closing the standard-fit electric luggage compartment lid. The rear seat back splits 40:20:40 as standard. The load-area width measures exactly one metre and the rectangular-shaped layout of this compartment makes it practical to use. With the rear seats folded down, the car can accommodate 1,300-litres. Expect pricing to sit in the same £30,000 to £40,000 bracket as before, though you'll have to find around £47,000 if you want the top sporting S5 version. As usual, there's a premium of around £2,500 to pay if you want to switch from any given petrol variant to its diesel alternative. If you want S tronic automatic transmission on the base petrol and diesel variants most will choose, there'll be a premium of around £1,500 more to find for it. Go for the diesel auto and you'll be offered the further option of finding £1,500 more to get quattro 4WD. All models come well equipped, every trim grade featuring xenon headlights with LED daytime running lights and LED rear lights, an 'Audi MMI radio plus' infotainment system with a 7-inch colour display, Bluetooth, a three-spoke leather multifunction steering wheel, a front centre armrest, a folding rear seat back with a 40:20:40 split, and LED interior lighting. Also standard are the Audi drive select dynamic handling system, the Audi pre sense city and multicollision brake assist safety systems, and a variable speed limiter. Many buyers will want to add in the desirable 'Audi Virtual Cockpit' TFT instrument binnacle, with its 12.3-inch screen and advanced graphics. A Head-up display can be ordered at extra cost. Also popular as an option will be Audi's top infotainment set-up, 'MMI navigation plus with MMI touch'. It includes such features as 10GB of flash storage, a DVD drive, Audi connect services for three years and an 8.3-inch monitor. The body of this MK2 model Audi A5 Sportback is the lightest in the segment and the car's overall weight has fallen by 85kgs to just 1,470kg. That's equivalent to asking your partner and smallest child to get out and walk and it has predictably positive effects on the car's efficiency figures. Also helpful is the optional 'Predictive efficiency assistant' which evaluates GPS information from the car's immediate surroundings and helps to save fuel by giving specific driving advice. We'll get to the efficiency figures - which Audi says have improved by up to 22% across the range, even though power outputs have risen by 17%. Even in its top 252PS guise, the 2.0 TFSI petrol unit is reasonably frugal, managing up to 47.8mpg on the combined cycle and 136g/km of CO2. The 190PS 2.0 TDI improves that to 67.3mpg and 109g/km - or 68.9mpg and 108g/km in 'ultra' form. The 218PS 3.0 TDI manages 61.4mpg and 119g/km. Audi has already proved with the A5 Sportback that there's room in the market for a compact executive model with a fifth door and an added dose of charisma. Whether the people buying it are actually conquest customers is another issue entirely of course, but when you're offering cars to suit every conceivable market niche, you can never be quite sure of that. What's certain is that this second generation model represents a decent step forward from its predecessor, lighter, more sophisticated and eminently more desirable. Which makes it even harder to ignore if you're target market for this kind of contender. One thing's certain: here's another very desirable Audi.